(0 Customer Reviews) | Write Review 4 issues per year Ultimate Supercar magazine looks at the most exciting automobiles ever built, where performance, looks and style are never compromised. We drive the very latest supercar models, while always recognising the heritage of the classic versions that came before. Tuning and modifying is all part of the world of supercars and some of these models are simply extraordinary - as are the people involved and Ultimate Supercar magazine gets in conversation with designers, tuners, racers and owners. We look at buying, owning and living with a supercar and there are certainly cars out there to meet all budgets. We regret to inform you that Ultimate Supercar magazine is ceasing publication from the Spring issue, which went on sale in February. 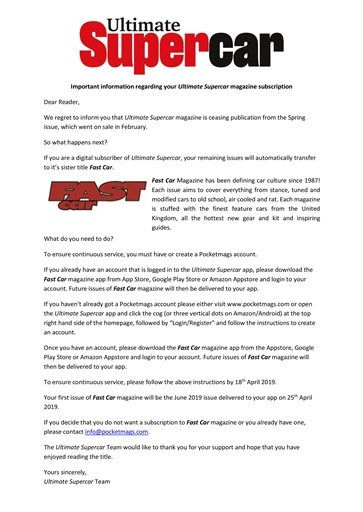 You'll receive 4 issues during a 1 year Ultimate Supercar magazine subscription. 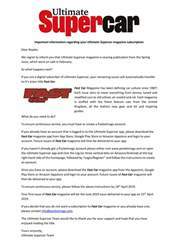 You'll receive 4 issues during a 1 year Ultimate Supercar magazine print subscription.